Dark Matters was born from a love for flavour and recipe experimentation, and a deep passion for all things brownie. Having worked in the bakery and cafe industry for many years, Dark Matters' founder Gemma Ann knew how passionate people were about brownies, and how a disappointing one could ruin a perfectly good cake-break, so she set about working on a recipe for the Holy Grail of Brownies. Dark Matter's deeply decadent dark chocolate brownies span flavours the traditional to the unusual and all with the emphasis on the chocolate. 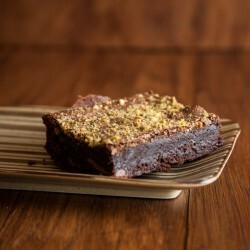 They're freshly baked in small batches using 72% Belgian Dark Chocolate combined with awesome quality ingredients and perfected recipes, ensuring their customers get the ultimate brownie fix. Dark Matter's devine ‘Queen of Sheba’ and ‘New Yorker’ brownies were highly commended and rewarded the Silver award by The Taste of the West Awards.